In which we will use a Firebase database in order to make a participatory GIS platform. One of the most interesting and exciting things about GIS on the Web is that it opens up the possibility to collect data from a wide variety of people all around the world. There are many different kinds of database and an in-depth study of database management is beyond the scope of this course. However, we are going to use one type of online database this week, and use it to store and manage some GIS data from our map. 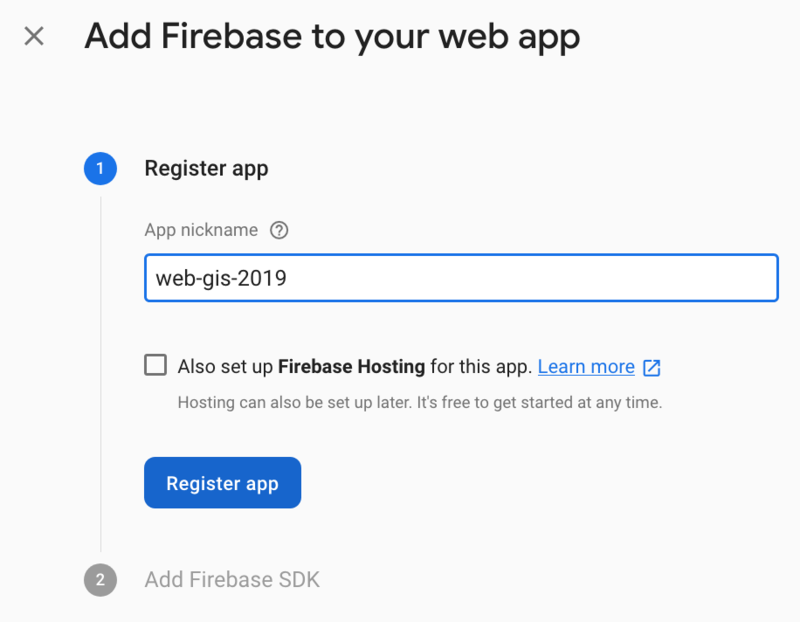 Go to the Firebase homepage and click on SIGN IN (located in the top right-hand corner). If you have a Google account already (e.g. if you use GMail, Google Docs, Android etc…), you should be able to do this straight away. If not, you will need to follow the instructions to sign up with Google first. Select Start in Test Mode and click Enable. Now you have a database! 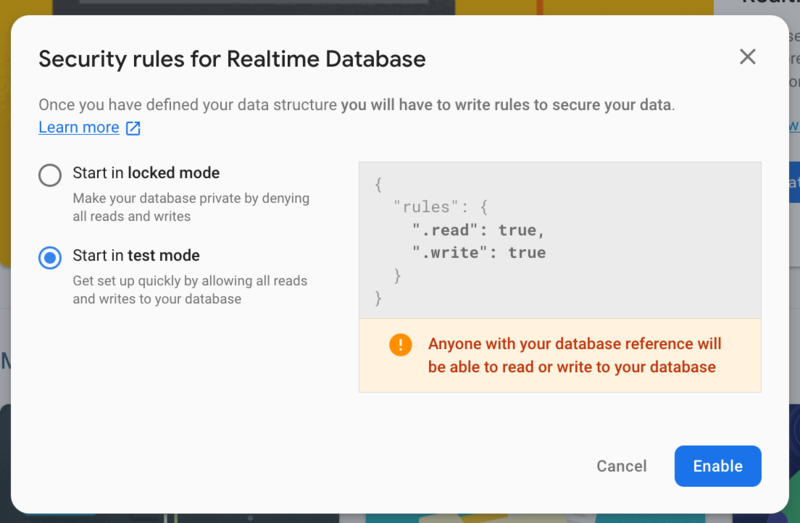 There are just a couple of things that we need to do before we can use it though: we need to set the database type and setup some security rules. Click COPY to add the code snippet to your clipboard. Simply click on Disabled next to where is says Anonymous and this box will appear - set the Enable switch to on and click Save. Now we have a connection to firebase and our map is ready to go, it is time to connect the Map and Firebase together. We are going to do this using Events. Our goal is to let users click on the map in order to add a point to it. In order to achieve this, we are simply going to listen for any click events on the map. Once again, in this example, you are simply putting the value directly into the function call as an argument, rather than a variable containing it. It makes no real difference whether the variable holds a function or a number. This code is getting the current location of the click using the event object (e) and extracting the location of the click using the .latlng property. We then convert the marker to GeoJSON format (using the .toGeoJSON() function). That’s it! At this stage, you have hooked up your map to the database, meaning that any clicks that you make on the map will appear in the database. However, we have not yet done anything to make those clicks appear on the map! Okay, now our map is able to talk to Firebase, we can start making it so that Firebase talks back to the map. Once again, we will do this using event listeners. We have already used a listener or a click event on the map in order to store our data in the database, now it’s time to draw the click onto the map as well! 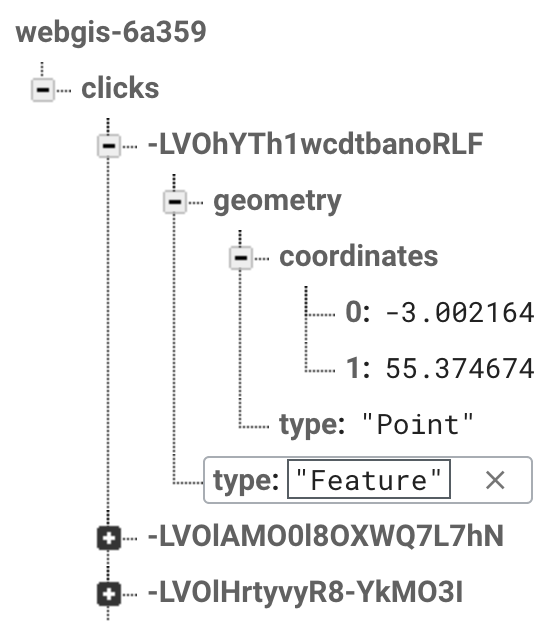 So our click GeoJSON points are the children of our clicks array in the database. Simple! This snippet creates an anonymous function as the listener for 'child_added' on myDb, taking a single argument called snapshot, which contains the data that was added to the database (a copy of all or part a database is often referred to as a snapshot). snapshot.key() Returns a unique id for that particular datum in the database (e.g. -LaK5fOorZio6ujt5Gfj). This is used to help firebase find the data that you are working with (adding / editing / deleting etc.). Clearly the code snippet for the 'child_added' event listener is incomplete! Paste it into your web page and console.log() the contents of newfeature to work out how to populate marker with an L.Marker() constructor (remember .addTo(map)!). Add the result to your code. Now try clicking on your map again, you should have a fully functional map! Click a few times then close the map in the browser and open it again, the points should still be there! Check in on the website, you should be able to see it! Hang on - something strange is happening here… Why does all of the data appear when you reopen the page? We have only told it to add them as they are created… Well, actually, the child_added event is called for each item in the database when you connect, and THEN for every new one as it is added, so you get a copy of the entire dataset at the point of connection, which is handy! Though the code to update Firebase looks a bit odd, it is actually relatively simple (create an object to with which to replace the existing object in the database and use it to ovewrite the contents of the database). Now we have successfully managed to delete a marker from the database using the above, it should be relatively simple to allow the users to update the location of the markers by dragging them. To achieveve this, we will firstly need to allow the markers to be dragged. If so, then well done! 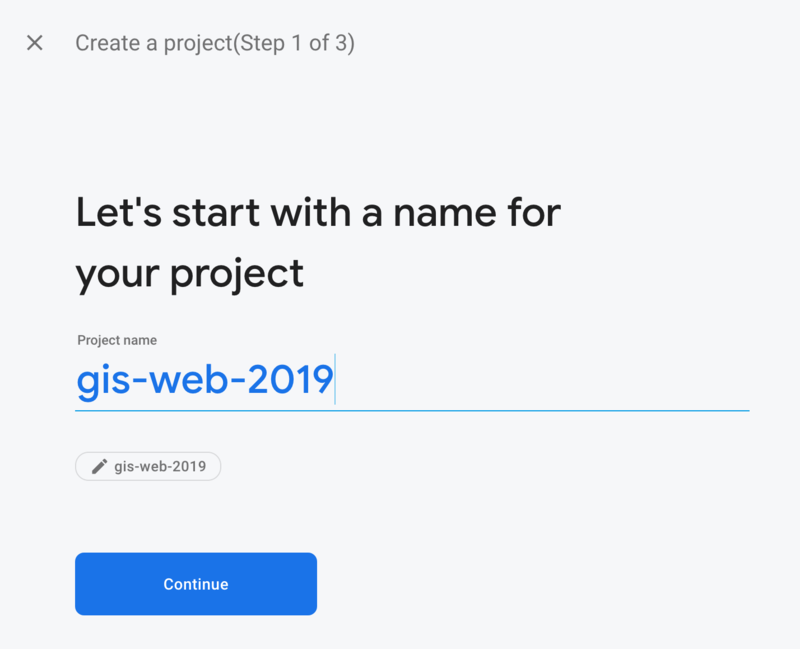 You have just created your own web-based Participatory GIS!